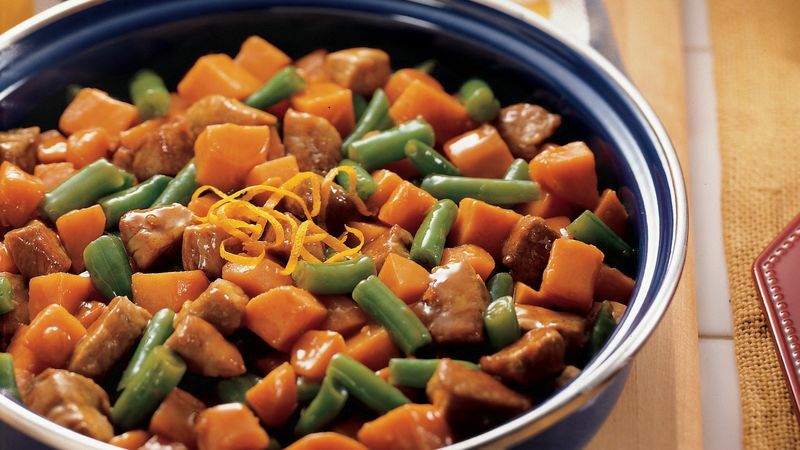 In large skillet, combine sweet potatoes and 1/2 cup water. Bring to a boil. Reduce heat to medium-low; cover and cook 8 to 10 minutes or until potatoes are tender. Drain and remove potatoes from skillet; cover to keep warm. Wipe skillet dry with paper towels. Heat oil in same skillet over medium-high heat until hot. Add pork; cook and stir until browned. Add green beans and teriyaki baste and glaze; mix well. Reduce heat to medium; cover and cook 8 to 10 minutes or until pork is no longer pink, stirring occasionally. Stir in cooked potatoes and orange peel; cook an additional 1 to 2 minutes or until thoroughly heated. * To quickly thaw green beans, place in colander or strainer; rinse with warm water until thawed. Drain well.